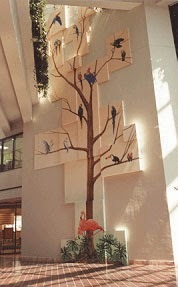 I created this big assemblage by painting 22 separate canvases and installing them in a five story atrium. The piece is 42 feet high. To give you a perspective the canvas with the Flamingos is 8 feet high.